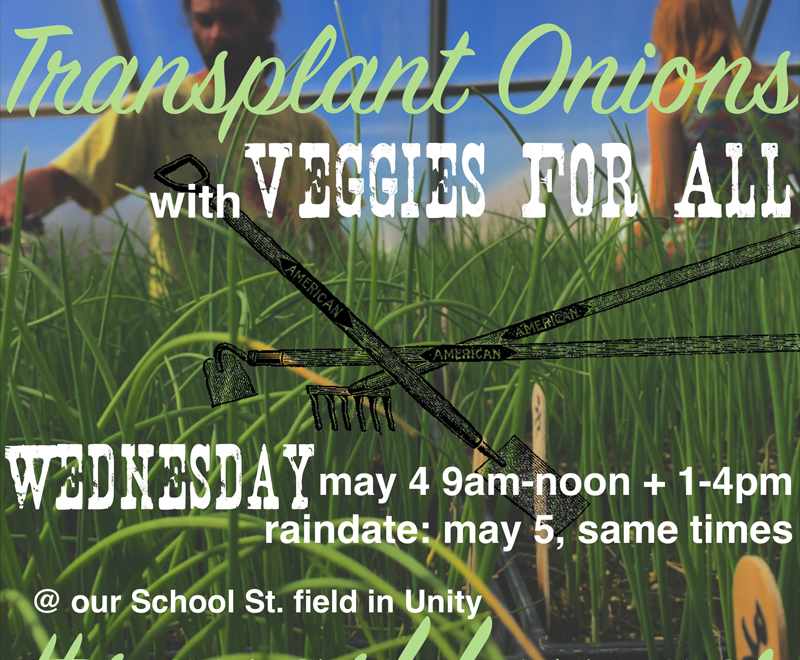 VFA invites volunteers to ‘squash hunger’ in the Unity area by helping us with the first big task of the 2016 growing season: onion transplanting! Wednesday May 4 9AM-noon and 1PM-4PM, with a rain date of Thursday May 5 9AM-noon and 1PM-4PM. C’mon out! We’ll meet at our School Street field (roughly 250 School Street or 0.7 miles west of the 202/139 intersection in downtown Unity) and work there for the duration. Look for the round, white sign that says “VFA.” If you pass the racetrack you’ve gone too far. RSVP not necessary, but helpful: programs@unitybarnrasiers.org / 207-948-9005. 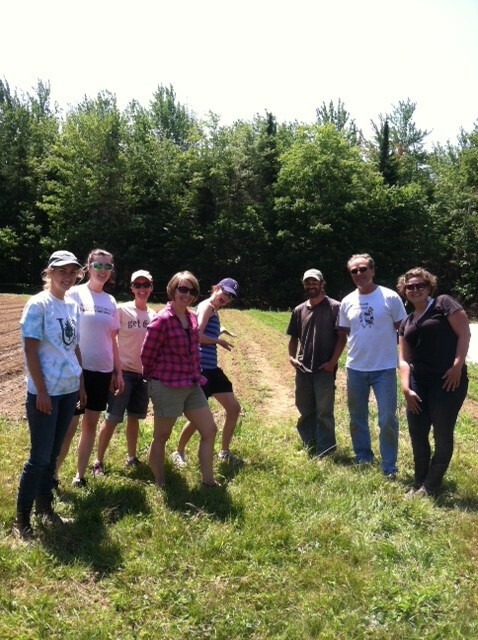 The Maine Association of Nonprofits came out to Veggies for All in Unity last week for a day of work (and play!) in the fields. Read their account of the day below. This was originally posted on their website. “You’ve never seen a group of people more excited to get out of the office than our staff! A full day with no phones or computers, spent with great people, playing in the dirt. It was a Wish You Were Here postcard kind of day. 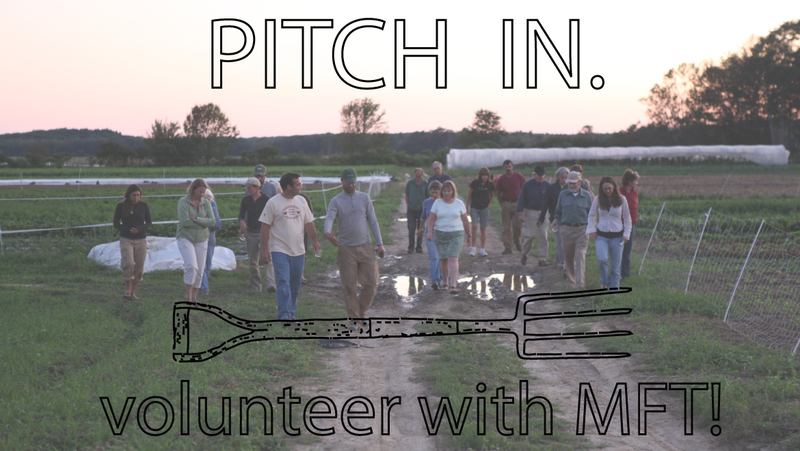 We had perfect weather, lots of laughs, a delicious lunch, and a thoughtful, well-planned day, all thanks to Sara Trunzo, Director of Veggies for All (VFA), a project of Maine Farmland Trust. necessary, collaborative, and inspiring. Over their 8 year history, they’ve grown and distributed over 108,000 pounds of pesticide-free vegetables which they make available to 9 food pantries and over 1,500 people in central Maine. This past year alone, VFA grew and distributed over 33,000 pounds of veggies, and engaged volunteers in 580 hours of service. “If you’ve never been to Unity, it’s worth a trip. 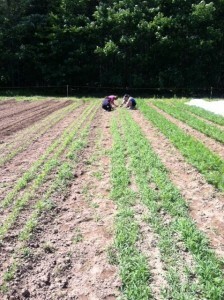 This town is a hub for all things sustainable, with Maine Farmland Trust, Unity College, Unity Barn Raisers and MOFGA all within just a few miles of one another. I’d never been to Unity except to attend the Common Ground Fair, so it was great to spend a day NOT in a long line of cars with the masses. 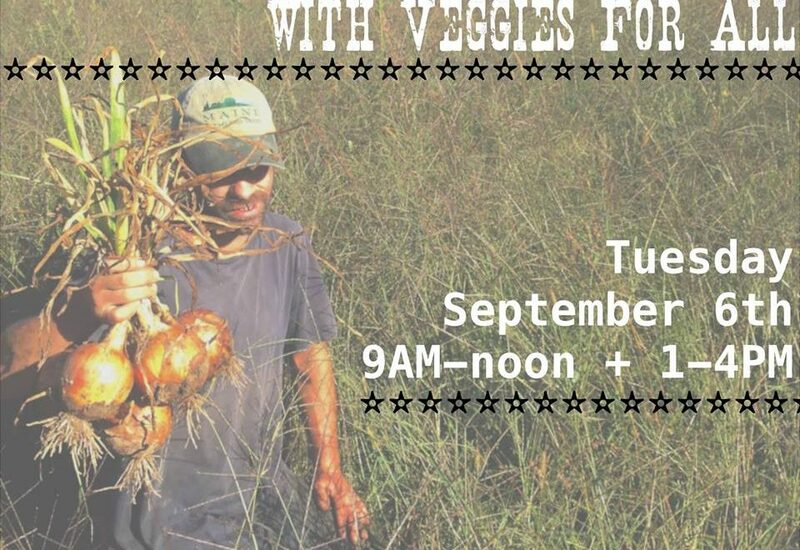 Instead we filled our water bottles, applied sunscreen, toured the VFA fields and Unity College, saw Maine Farmland Trust’s new beautiful building, and then got to work thinning carrots under the watchful eye of Tim Libby, VFA’s Farm Manager. “We were rewarded with a nap-inducing overabundance of lunch, prepared for us by Monica Murphy, owner of Crosstrax restaurant. Delicious pizza, salads and roasted VFA summer squash, and a blueberry tiramisu for dessert. Ready for a nap! “No nap, back to the fields. Most of us were groaning as we bent over the tiny plants, our muscles tightening, trying our best to pull only the weeds. Then a drive back to Portland the back roads way with all the beauty of Maine waving as we passed. Thanks for helping out, MANP!